One of the most popular projects for people who crochet is making afghans using free patterns. Everyone will appreciate all of the hard work that you put into making an afghan. 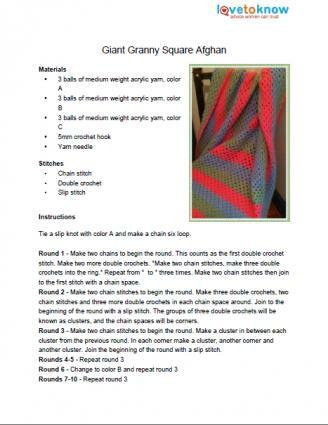 Creating an afghan from Granny squares is a great project for those who are new to crocheting. 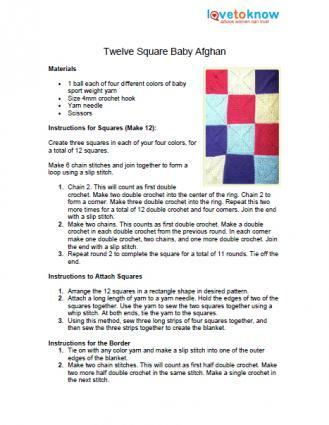 Because you make all of your squares first and connect them later, these projects are very portable. Take your crocheting along with you to pass time no matter where you are. Great for a gift or to use yourself on those chilly winter nights, this Granny square afghan fits a double bed perfectly or looks lovely on the back of the couch. Personalize this project with your favorite yarn colors. If you need help downloading any of the printable patterns, check out these helpful tips. Any mother-to-be will appreciate this darling and oh so soft crochet baby blanket. Use any colors you wish and add a contrasting border. Use these tips to help make the best afghan possible and to make your crocheting easier. Choose high quality yarn and be sure to use baby soft yarn for the baby afghan. Crochet extra squares if you want to make your afghan larger. Practice your stitches before you begin, especially if there are any in the pattern that you are unfamiliar with. This will keep you from having to backtrack if you make a mistake. Tie a piece of ribbon or sew a small flower or heart motif to the center of each square to add more detail. You can also create a pattern by adding these embellishments to only certain squares, like those of the same color or those that run diagonally. Try a straight single or double crochet border for a different effect. Of course the Internet provides many other places to find free patterns for afghans and much more to crochet. Here are a few of the best. Crochet Pattern Central has a wonderful collection of free patterns from all over the web. Some are in PDF format, while others are simply on websites. Most of the links seem to be live, but some are very slow to load. Crochet N More has nearly 20 patterns, almost all with pictures. Some of these patterns are for squares that you can combine or repeat to make an afghan of whatever size you like. Knitting-Crochet has another great list of patterns. Some of the patterns listed are for knitters, but the site also sells a book about how to convert patterns from knitting to crochet or crochet to knitting. Apartment Therapy has a pattern for a really cool retro Granny square blanket. Although often you can go to the store and purchase a blanket for less than you can make one, there is nothing quite so rewarding as crafting your own afghan. Crocheting is a hobby enjoyed by millions of people and giving a handmade blanket as a gift has special meaning. If well taken care of, afghans can last for a very long time and are often passed down within families. Remember that half the fun is in the journey, so enjoy making your afghan.